Indonesia and the ASEAN integration: What do foreign investors need to know? Last month, a report by JLL highlighted that the regional integration of the Southeast Asian nations generates a market of over 600 million people, with a combined gross domestic product of around $2 trillion. Of this market, more than a third is in Indonesia, which has a population of 252.8 million. There is a lot of work and preparation to be done before the integration at the end of the year. Once these hurdles have been overcome, a single economic market for the 10 member states will no doubt help Indonesia's property market. 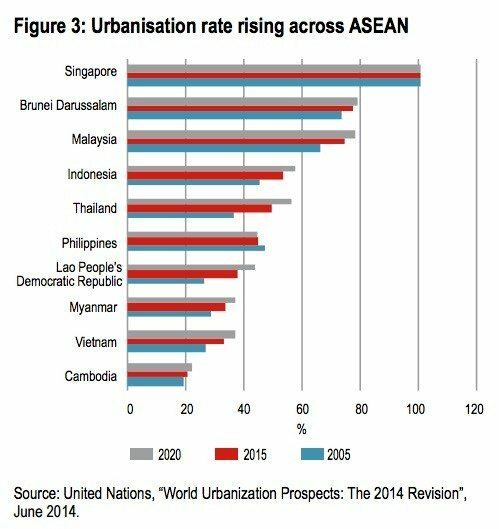 But when it comes to the local property market specifically, Indonesia will perhaps not see as much change as its Southeast Asian neighbors. Local developers have strong balance sheets and historically have never needed to rely on funding from foreign developers to grow. Most developers either raise local equity funding in Indonesia, or foreign currency denominated debt in Singapore. Neither would be impacted by the ASEAN integration. The huge Indonesian consumer market is very attractive for foreign companies. In fact, the World Investment Report 2015 stated that foreign investment into Indonesia has increased by 20 percent — the highest in Southeast Asia. Most of the strategic land banks are currently owned by local developers. What do foreign investors need to know? It’s expected that, following the integration, there will be more partnerships between foreign investors and local developers. With such a potent combination, it should be easier to meet the pressing demand for housing, as opposed to the current structural lack of supply. That said, following the integration, I would expect an increase in demand from foreigners traveling within the community for business, which will also increase the need for more properties. In its Ease of Doing Business Index 2015, the World Bank Group ranks Indonesia at number 114 of 189 countries around the world. This number is an improvement from 120th position in 2014, as Indonesia slowly improves efficiency for enterprises and businesses. When entering into business in Indonesia, foreign investors need to know exactly what they want. For example, are they looking for a big or a small investment opportunity? Which market do they want to invest in? What are their expectations in terms of ROI? The biggest challenge ahead of the integration is Indonesia’s weak infrastructure. Poor planning in the past is a present-day problem. If you look at Jakarta, for example, the city is getting more crowded with time; the heavy traffic is limiting the city’s growth, both economically and physically. For example, though the government’s Mass Rapid Transit (MRT) program to relieve congestion at a cost of around $1.7 billion is working against this problem, the project is not slated for full completion until 2027. This problem urgently needs solving prior to the integration. Despite the transportation and infrastructure development issues, investment in property in Indonesia is still considered to have great potential. Local players, such as developers, agents and brokers, continue to obtain multiplying profit. Having easy, well-structured access (toll roads, highway and railways) will affect property value in the years to come. Provision of public facilities in the housing neighborhood will also increase property value (healthcare, education, retail, etc.). Where should foreign investors look to invest, in light of these development issues? As the MRT system develops, areas in proximity will become popular investment hotspots. The main focus for property investment remains in the greater Jakarta area. With fresher air and rapid infrastructure development, Bogor, for example, is prospective for investors. Tangerang’s developing smart cities, such as Bintaro and Serpong, will also make for exciting investment opportunities for foreigners. Developers are also focusing their attention toward cities outside of Java, such as Surabaya, Medan and Makassar. With an increased inflow of foreign investment will come a need for greater transparency in the sector and the reconsideration of ownership rules. Local property professionals are pushing for the government to change the law on foreign ownership, and they seem to be getting positive feedback. If the law does change, clear measures will need to be taken so that the local market is not disrupted because there is concern that local property prices will skyrocket once the law is changed. But if the government creates a strict rule set and sets the right price limit, this could be avoided. The silver lining for many will be in outbound property deals. Huge companies such as Sinarmas Land and Lippo Group already have holdings in Singapore and Malaysia. And if property ownership and investment laws become more relaxed in ASEAN counterparts, we might see a foreign-bound acquisition in countries with a more fragmented property market, such as Vietnam and the Philippines. How should a foreign investor vet or select a local developer to partner with? Although foreign investors tend to have sufficient funds and lower-cost technology, it will not be easy to compete with local developers, who have greater control over the market and are more widely known. Foreign investors must understand this condition, and both parties must be able to harness the potential in each other. When selecting a local developer to partner with, foreign investors must take note of any company’s credibility, previous work and the team of contractors, architects and consultants with whom they are working. By analyzing previous projects, investors can get a good idea of their future partner’s efficiency and reliability. Should investors jump on the bandwagon now or wait until some of these kinks have been worked out? To consumers, the idea of foreign developers is considered positive, as it will bring them greater opportunities. Foreign developers, such as Keppel Land, have admitted that in recent years, Indonesian economic conditions have impacted the slowdown of the property sector. However, there is now a sense of optimism that this issue can be resolved properly, in line with the start of economic restructuring and increased spending on infrastructure by the government. Of course, decisions are dependent on each particular project and each investor. High-end projects with well-known developers are likely to have strong capital; therefore, the chances of any problems with these projects, such as bankruptcy, are minuscule. As an investor, you must decide: how big is the risk that you are willing to take? It’s an interesting, exciting time for the Indonesian property market. The AEC could open up a lot of opportunities for us, particularly regarding foreign exchange, strong rental yields and market growth. But there is a lot of work and preparation to be done before the integration at the end of the year. Once these hurdles have been overcome, however, a single economic market for the 10 member states will no doubt help Indonesia’s property market. A single economic market for the 10 member states will help Indonesia’s property market. Steven is ​Co-Founder and Managing Director of Lamudi Indonesia, part of a global property portal, present in over 30 countries with its headquarters in Berlin. Follow Lamudi Indonesia on Twitter.